Choose Settings→Mail, Contacts, Calendars from the Home screen. The Mail, Contacts, Calendars settings screen appears with the Accounts section at the top. Tap the Add Account button and then tap the account type from the list of account types that appears. Your choice is iCloud, Microsoft Exchange, Gmail, Yahoo! Mail, AOL, Microsoft Hotmail, or Other (not shown). After you tap the account type, the New Account screen appears for iCloud, Exchange, Gmail, Yahoo! Mail, and AOL accounts; the Other screen appears for Other accounts. iCloud, Gmail, Yahoo! Mail, or AOL: Enter your name, username, password, and optional description in the New Account screen, and then tap Save in the upper-right corner. Exchange: Enter your name, username, domain (optional), password, and optional description in the New Account screen, and then tap Next in the upper-right corner to move on to the Exchange account’s settings screen. Microsoft’s Autodiscovery service kicks in to check your username and password to determine the address of the Exchange server. If it can’t find the server’s address, a dialog appears for you to enter it — enter the complete address in the Server field and tap Save. Other: Tap Add Mail Account on the Other screen for an IMAP (Internet Message Access Protocol) or POP (Post Office Protocol) account. The New Account screen appears; enter your name, username, password, and an optional description, and then tap Save in the upper-right corner to save account information. The iPod touch searches for the account on the Internet and displays the New Account settings screen. iCloud or Exchange: Turn on any or all the items you want to sync: Mail, Contacts, Calendars, and Safari for bookmarks (iCloud only). If you sync these items using your iCloud or Exchange account, syncing them in iTunes is turned off, and they are replaced by the iCloud or Exchange account versions in your iPod touch. You can always return to the account setting’s screen to turn them off in order to enable syncing with iTunes. For Exchange, you can set how many days of e-mail you want to sync. Tap Save in the upper-right corner to finish and save your settings. Other: Tap IMAP or POP on the New Account settings screen, depending on the type of e-mail account you have — ask your e-mail service provider if you don’t know. Then enter or edit the existing account information (also get this information from your service provider if you don’t know). Tap Save in the upper-right corner to finish and save your settings. The Mail, Contacts, Calendars settings screen appears with the new account listed in the Accounts section. When the Sync or Cancel warning appears for iCloud or Exchange accounts, tap Sync (or Cancel). When you tap the Sync button, iCloud or Exchange overwrites any existing contacts, calendars, and bookmarks on your iPod touch (or the subset of these that you chose in Step 4). After you finish syncing, the Mail, Contacts, Calendars settings screen appears with the new account listed in the Accounts section. Tap Fetch New Data on the Mail, Contacts, Calendars settings screen, and tap Off for the Push option to turn it on (if it isn’t already on). That’s it! Your iPod touch syncs automatically from this point on, with data pushed or fetched from the e-mail account depending on your Push and Fetch settings. 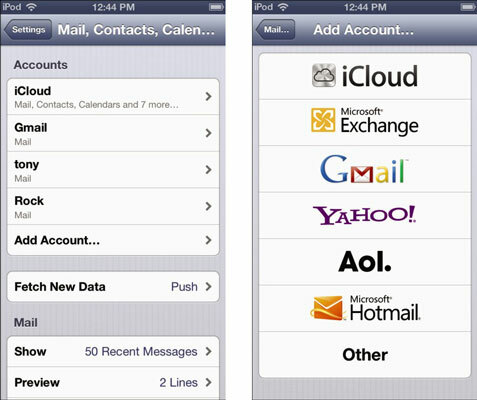 Whether the messages in your inbox appear on your iPod touch and on your computer depends on the type of e-mail account you have and how you’ve configured it. For example, if you delete on your computer an e-mail message from a push account (such as Exchange) or from an account set up to delete messages on the server as soon as you delete them on your computer, the message also disappears from your iPod touch.